NEW YORK, New York, April 27, 2012 (ENS) – In support of New York City’s pledge to double recycle efforts by 2017, a national crowd-source recycling initiative, The Great Recycle, will open in Times Square on Monday, April 30. The campaign’s first goal is to recycle more than 45,000 plastic, glass and aluminum beverage containers in 10 hours. A recycling bin in Times Square as tall as a three-story building will receive the containers. The initiative is the brainchild of organic bottled tea company Honest Tea, purchased by Coca-Cola last year. Honest Tea will kick off the Great Recycle by attempting to recycle the same number of bottles the company sells in New York City on a single day. The U.S. Environmental Protection Agency estimates that Americans recycle just 27 percent of plastic bottles and about 33 percent of glass bottles. At the event in Times Square, bottles will act as currency. People who bring bottles down to The Great Recycle bin will be awarded points for each bottle recycled. The points can be redeemed at the onsite TRASHed Recycling Store run by Global Inheritance for rewards such as cold bottles of Honest Tea, t-shirts and reusable bags, jeans, video games, and tickets to sporting events, concerts and Broadway shows. The plastic bottles collected will be recycled into gardening supplies such as shovels, watering cans and plastic lumber, which will be used to build and cultivate an urban garden for PS 102, an elementary school in Harlem. Partnering with Honest Tea for The Great Recyle initiative are: GrowNYC, Recyclebank, Global Inheritance, Five-Boro Green Services and Coca-Cola Live Positively. “New York City is a world leader in many areas and is committed to actions that secure a sustainable and livable future for all residents,” said David Hurd, the director of Office of Recycling Outreach and Education for the nonprofit GrowNYC. Those who cannot attend the event in Times Square can participate in “The Great Recycle” by logging onto www.TheGreatRecycle.com and making a recycling pledge and then solidifying it by recycling an old Facebook post. By taking the pledge, users will be rewarded with Recyclebank points which can be redeemed for discounts and deals from more than 3,000 local and national businesses in categories ranging from food and beverage to health and beauty, restaurants, entertainment, sports and recreation, apparel, automotive, electronics and more. As part of this campaign, Honest Tea has produced a 60-second video that follows one bottle from purchase through discard to recycling. See it on Honesttea.com and at Thegreatrecycle.com. To publicize the campaign, Honest Tea is using Facebook ads and a new Twitter hashtag called #GreatRecycle, which will appear on the side of the giant bin and on recycled paper fliers to be handed out across New York. 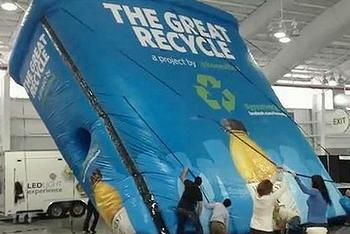 In the coming months, the Great Recycle will appear in other cities across the United States. This is not Honest Tea’s first recycling effort. The company partnered with TerraCycle in 2007 to create the Drink Pouch Brigade, a program that recycles drink pouches and upcycles them into pencil cases, book bags, and notebooks. Since 2007, nearly one million Honest Kids pouches have been diverted from landfills. The Drink Pouch Brigades now divert more drink pouches from the waste stream than Honest Tea produces each year. In 2008, Honest Tea partnered with Bethesda Green and The Coca-Cola Company to install 33 recycling bins throughout downtown Bethesda. Within the first year the bins collected more than 4,000 pounds of recyclable beverage containers.